As winter still is in full bloom (or rather in full snow) I have done another snow project. This one is a bit tricky and requires a lot of patience. Cut the sheet of paper in two crosswise. 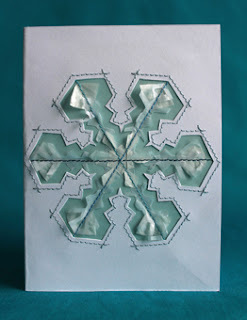 Draw the contour of a snowflake and cut out. Cut out a snowflake from the transparent paper. Cut out a small hexagonal crystal shape for the center and 6 pieces for the tips of the snowflake from the sandwich paper. Align them all on your background paper in layers, so that they fit into the snowflake cut-out of the cover. Glue carefully only in the center of each 'arm' of the snow crystal, so that it is just fixed a bit, but the ends will remain loose. Sew the layers together, using different shades of sewing thread for each seam. Glue under the cover and sew carefully together. Glue the finished cover and the other half of the A4 sheet together. Cut off protruding edges if necessary. Very carefully pull the loose ends of the tranparent parts of the crystal a bit off the background for a more 3D look. Fixing the transparent paper onto the background and sewing everything together are the trickiest parts. If your sewing machine allows for extra slow sewing, take the chance.